Spectroscopic ellipsometry has been a key measurement technique in characterizing solar cell component materials and device structures. Specifically, the ellipsometry technique remains the only method by which the optical constants and the band gap can be determined accurately. Furthermore, very high sensitivity for material layer thickness makes an ellipsometry technique as a suitable method for device structural characterization. 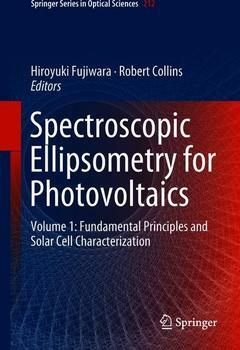 The first volume of Spectroscopic Ellipsometry for Photovoltaics presents fundamental principles of the ellipsometry technique, with a focus on characterization methods of solar cell materials and devices. In particular, this book covers the data analysis methods for a broad range of solar cell materials/devices, from traditional solar cell materials (Si, CuInGaSe2, CdTe and III-V) to more advanced emerging materials (Cu2ZnSnS4, organics, and hybrid perovskites), fulfilling a critical need in the photovoltaic community. A comprehensive review for transparent conductive oxides is also provided. The key objective of this book is to provide theory, measurement, and data analysis/modeling for a variety of solar cell component materials and basic device structures. Introduction.- Part I: Fundamental Principles of Ellipsometry.- Measurement Technique of Ellipsometry.- Data Analysis.- Optical Properties of Semiconductors.- Dielectric Function Modeling.- Effect of Roughness on Ellipsometry Analysis.- Part II: Characterization of Materials and Structures.- Ex-situ Analysis of Multijunction Solar Cells Based on Hydrogenated Amorphous Silicon.- Crystalline Silicon Solar Cells.- Amorphous/Crystalline Si Heterojunction Solar Cells.- Optical Properties of Cu(In,Ga)Se2.- Real Time and In-Situ Spectroscopic Ellipsometry of CuyIn1-xGaxSe2 for Complex Dielectric Function Determination and Parameterization.- Cu2ZnSn(S,Se)4 and Related Materials.- Real Time and Mapping Spectroscopic Ellipsometry for CdTe Photovoltaics.- High Efficiency III-V Solar Cells.- Organic Solar Cells.- Organic-Inorganic Hybrid Perovskite Solar Cells.- Solar Cells with Photonic and Plasmonic Structures.- Transparent Conductive Oxide Materials.- High-Mobility Transparent Conductive Oxide Layers.